We are doing lots of Christmas partying in Lynden with family between snow storms. Monday night was with the Bulthuis family and Wednesday night with the Eides. During our gift exchange Christmas Eve, Bjorn and Jenny opened a message from their OB/GYN, informing them of their child's gender. They have been waiting three weeks to open it, as have the rest of us. Only 4 of the 15 of us guessed right -- A Girl! 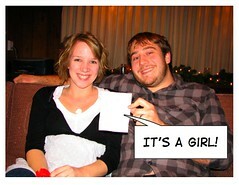 Though most were expecting a boy, we are all thrilled that there will be a new Bulthuis girl in the family. I am so excited for you and Esther!! Esther is going to have so much fun with a little girl! !